If my children get anything from me, it is their creativity. They both love making up characters and stories. My daughter, Beanie, especially loves dressing up, and all things princesses and fairies. I usually get to join in, too! And all that make-believe play has reminded me of a quilling tutorial that I’ve been wanting to do for a while. Let’s make some fairy-inspired mini 3D quilling paper mushrooms! As usual, start by choosing the color you’ll be using for the main part of this project, the mushroom cap. I picked a traditional red called Crimson from Lake City Crafts, but you could go really playful with these and choose a pretty purple, green or blue! Next, glue 4 strips end to end and roll into a tight coil. Since I just reviewed the Curling Coach last week, I wanted to put it to the test again with this tutorial too, and I really found it helpful in keeping these big coils straight! 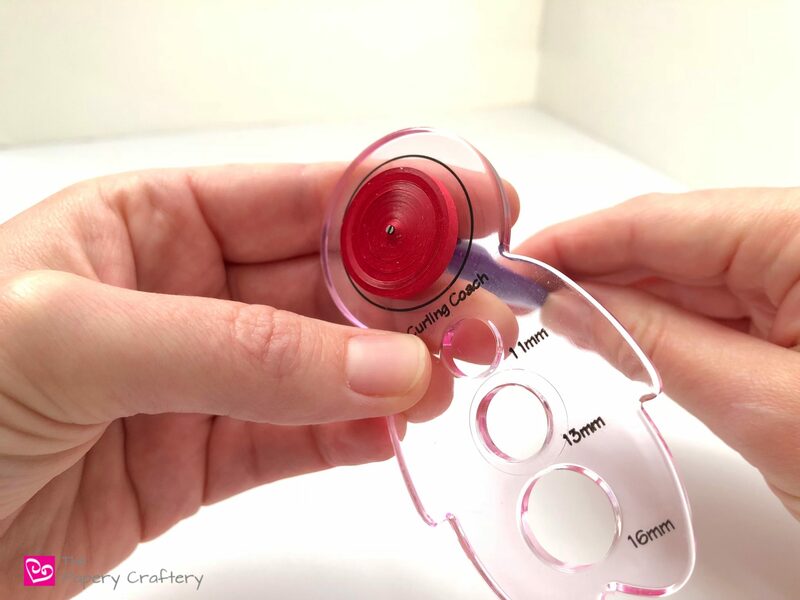 Using your fingers, quilling mold, or whatever tool you prefer, shape into a dome. Lightly brush the underside with glue and let dry to seal the shape. I wanted to add some white to these toadstools to mimic the white ribs underneath the cap. To do this, roll about 3 strips of white. Check and see if it fits inside the red dome. You want it to be a little smaller in diameter so it sticks out a bit. If there seems to be too much of a gap between the two domes, you can always add a little more white paper. Glue to the underside of the red dome so that the edge of the white is still visible. While your domes are drying, its time to make the mushroom stems. These will be basic quilling paper tubes. They can be made with any slotted tool. If you’re using a basic small slotted tool, check out the steps to make a tube in the quilled monarch butterfly post. You can also use a long slotted tool. This might be my new favorite quilling supply! Tubes are so easy with it! To make yours, roll an extra-long strip of ivory quilling paper (or two shorter strips glued together if need be). After you’ve wrapped your strip around a few times and a bit of a base built, continue rolling your paper but move towards the handle of your tool, overlapping a bit each time. This may be a bit tricky at first, but I promise once you get the hang of it, you’ll move really quickly! When your stem is the shape you want, glue the excess paper to finish. Brush the outside with glue to set the tube. If you want a slightly curved stem, you could shape it now by pushing it against the tool as it dries. Once the stem is dry, twist and pull gently to remove it from the quilling tool. Glue stem to the mushroom cap. Lastly, add some white spots to your toadstools! Cut short white strips in half lengthwise, or use 1/16″ paper if you have it. Then, roll small coils around tools that have different widths to make a few spots of different sizes. Randomly place your spots and there you have it! Teeny, tiny 3D quilling paper mushrooms! When you’re ready to display your quilled mushrooms, think about planting them in a terracotta pot. You’ll need to fill the pots with floral foam, just like with these hydrangea topiaries. I also added a little moss to really give the feeling of these mini toadstools growing to a forest floor. 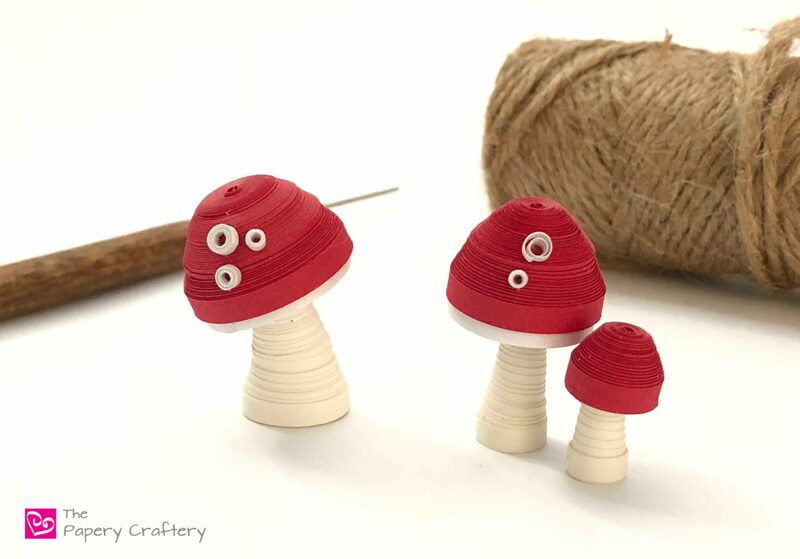 I’m sure you’ll find the perfect use for these 3D quilling paper mushrooms. Maybe get extra ambitious and roll up some tiny caterpillars or a fairy for a truly whimsical woodland scene! As always, let me know your thoughts below. By the way, I’ll be taking next week off to enjoy Halloween with my little goblins, but I’ll be back soon with a new post!